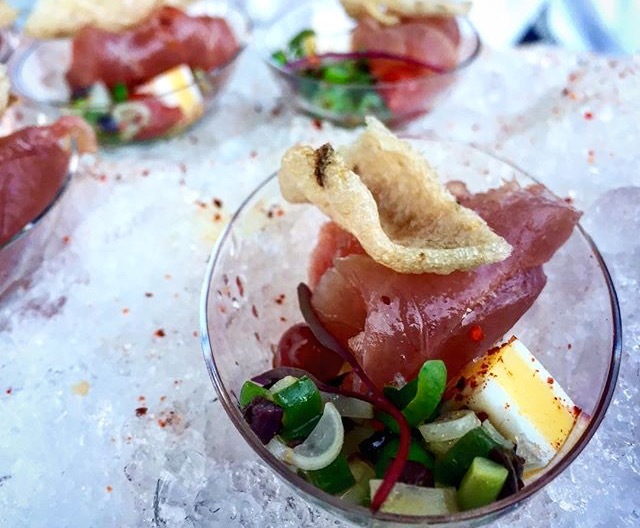 Three nights and four days of sampling cuisine from LA’s local chefs and the food world’s biggest culinary stars, along with Master sommeliers pouring vino from a 100 wineries (most California vineyards) made the 5th Annual Los Angeles Food and Wine a Foodie Fest success! 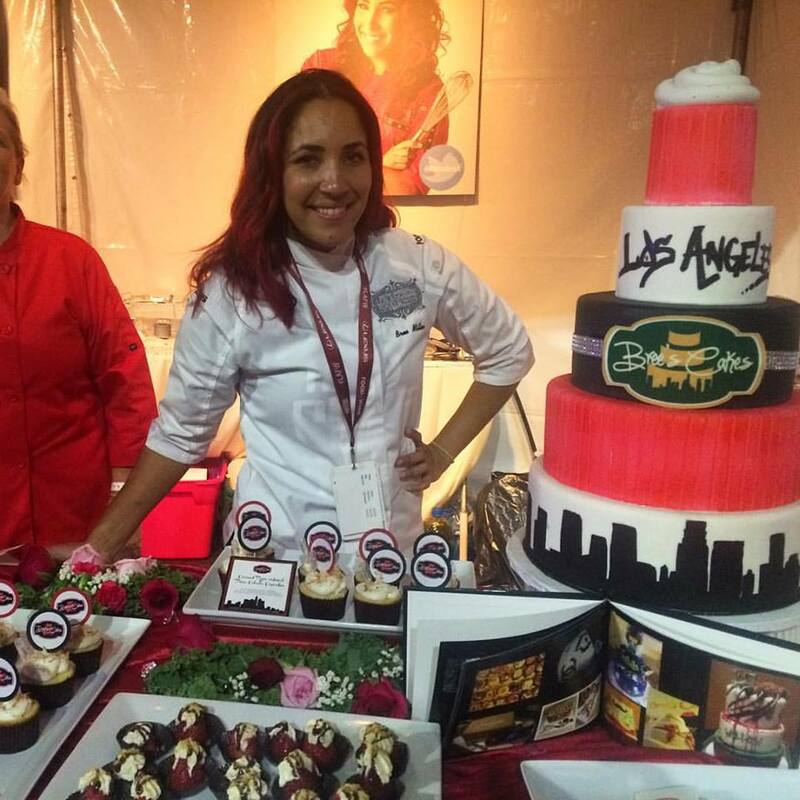 This city-wide jamboree celebrated food, wine, celebrity, music and our beloved Los Angeles. Thursday night I arrived for the final hour to find guests and chefs moving and grooving to Mike D spinning from the Beastie Boys. Curtis Stone had just left the mic after sharing his love of our city and the food culture so many of us our witness to daily. 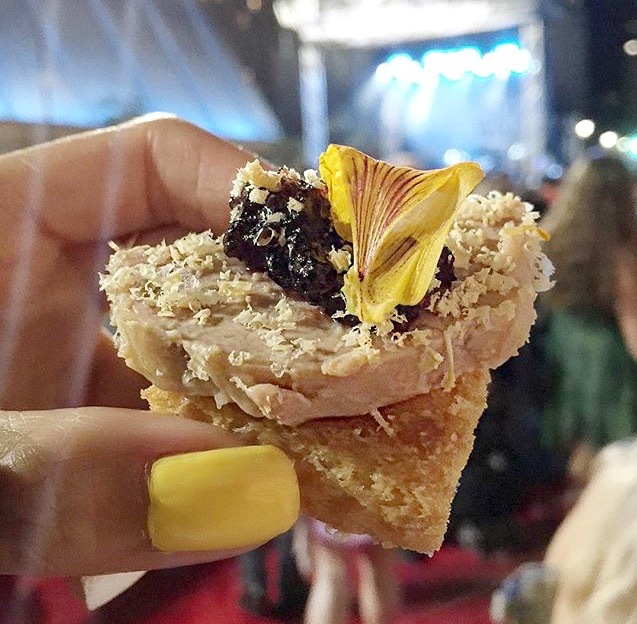 The dynamic energy of happy people mingling, sampling food bites, and dancing down the center of downtown LA on the massive red carpet on a hot summer night reminded me once again why I love this city so much. Revelry, and smiles everywhere you looked, even the chefs and hard working staff at every booth seemed elated to be here. Perhaps it was the wine, but I’ll assume it was the ‘chef-love’ for their craft, and the Angelenos of every culture ecstatic to be part of this grand affair. 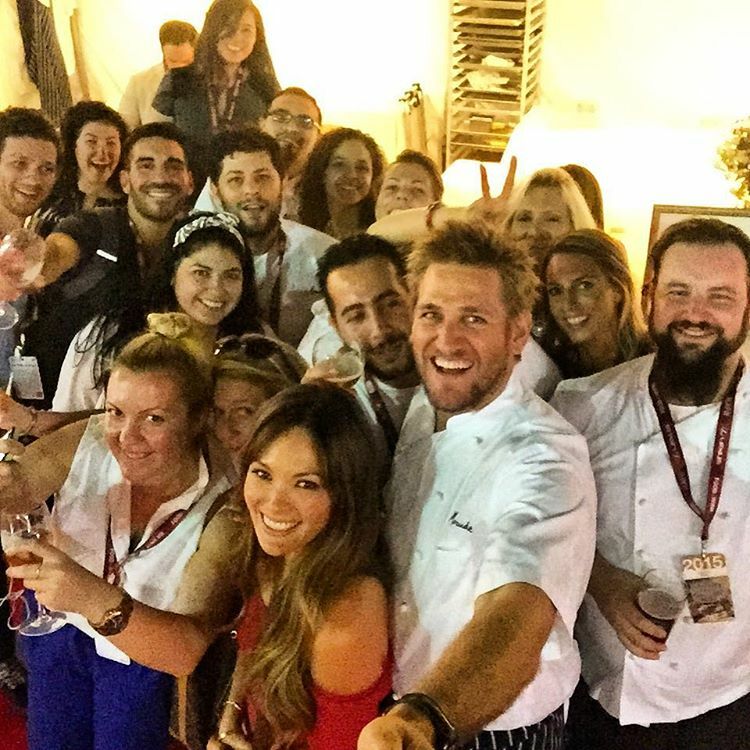 Curtis Stone selfie at 5th Annual Los Angeles Food and Wine Festival 2015. 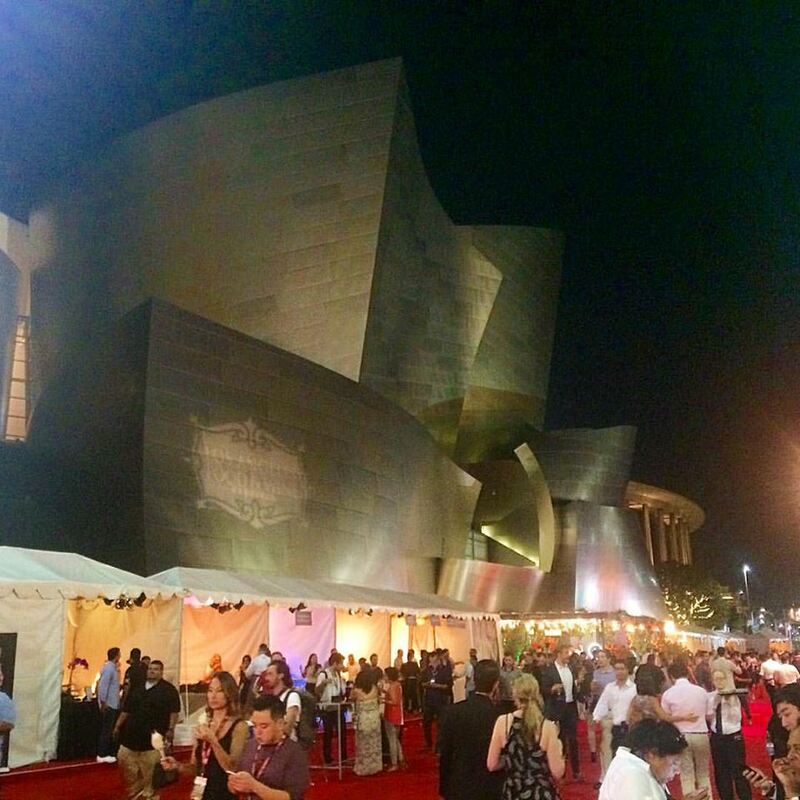 As I skipped down a side road at 9 PM pretty much all to myself under the looming Walt Disney Concert Hall that was gleaming silver in all its angular twists and turns, I entered this special Angeleno Foodie Fest to be greeted with an empty glass ready for my wine hopping consumption. I stuck to sampling all of the Paso Robles Vineyards I could find, like Tablas Creek and Justin, two vineyards I knew with quality grapes. When I veered down the path of sampling ones I had not heard of, disappointment set in. 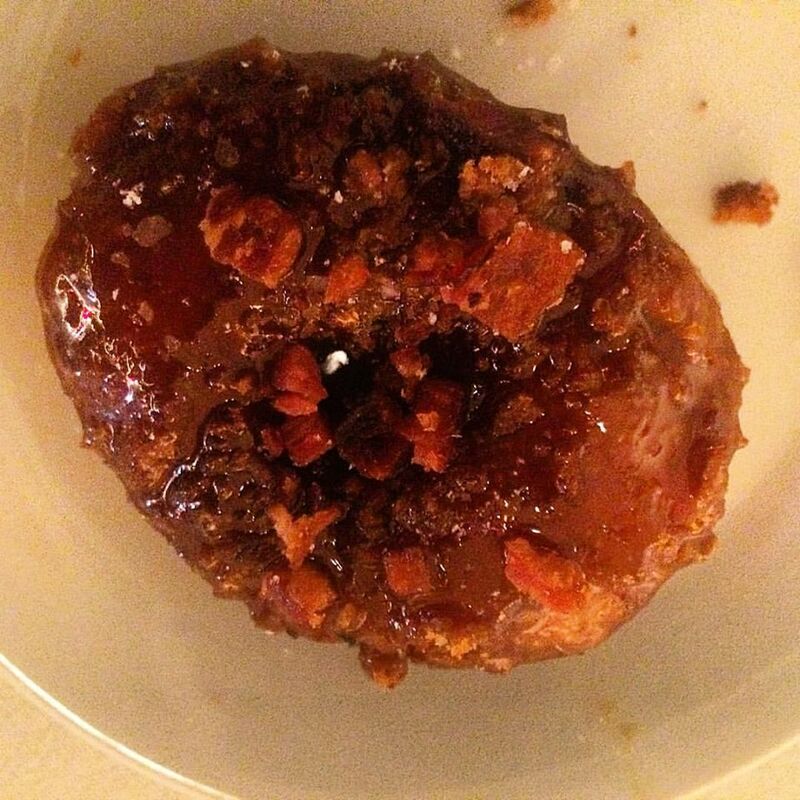 The best food bite I devoured Thursday evening was dessert from ICDC (Ice Cream Doughnuts Coffee on Beverly), a bacon candied donut topped with crushed pretzels. Bree’s Cakes tantalized us with strawberries stuffed with cheesecake, as Bree and her staff were dancing the night away serving their treats. 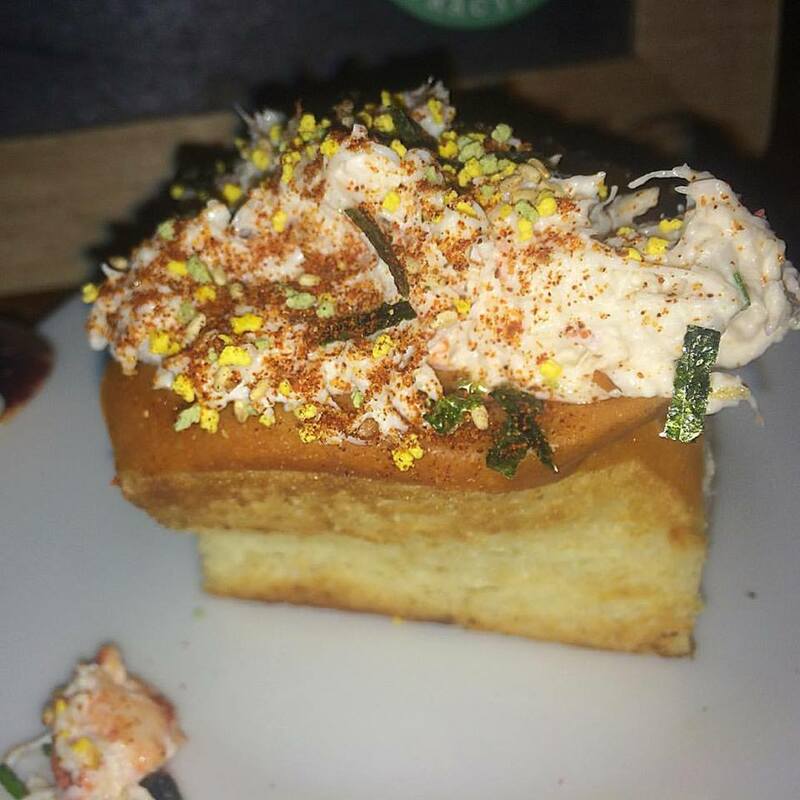 Other sensual bites included the ‘Clobster’ from Slapfish serving a mini toasted bun with lobster and crab. Several creative tuna sashimi bites were featured from Blue Ribbon Sushi Bar & Grill (now at The Grove) and Water Grill, and one included coconut sticky rice, passion fruit curd with a Hatch chili nuoc cham, garnished with crispy shallots, fresh coconut, basil and cilantro from Chef Steven Fretz from The Church Key in West Hollywood. Saturday night I came back to enjoy more bites with my good friend Jasmin Rosemberg from Variety. While the backdrop tunes buzzed from Questlove and The Roots, we made our rounds on a mission to find bites that blew us away. It was packed and the lines were everywhere to our chagrin, but they moved quicker than expected. Our favorite dessert bites included the waffle pieces from the Waffles de Liage food truck, organic cotton candy with flavors like Pink Champagne and Mango Chili from Bon Puf (Oh how I love that name because it’s fun to say), and strawberry shortcake with mascarpone and sweet cream ice cream from Ori Meneshe‘s sweet wife Chef Genivieve Gergis from Bestia. 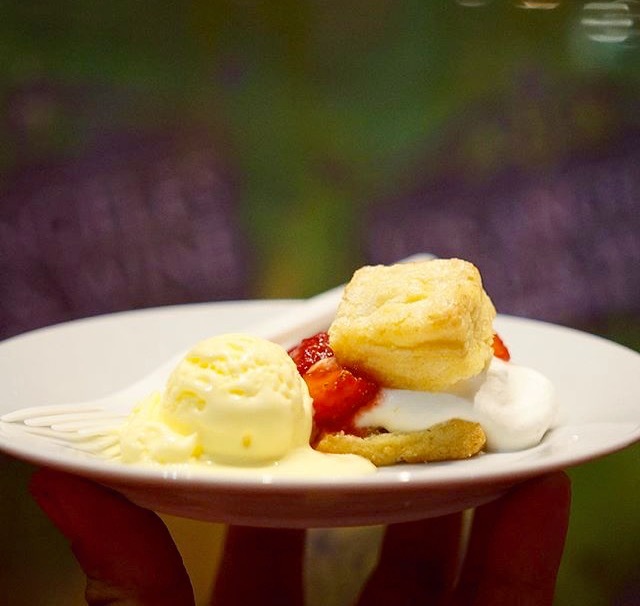 And Lexus, one of the founding partners of the event, definitely knew what they were doing because I saw some of the ultimate food bites leaving their area, and I was lucky to stumble upon their large cup of Summer Peach tres Leches. 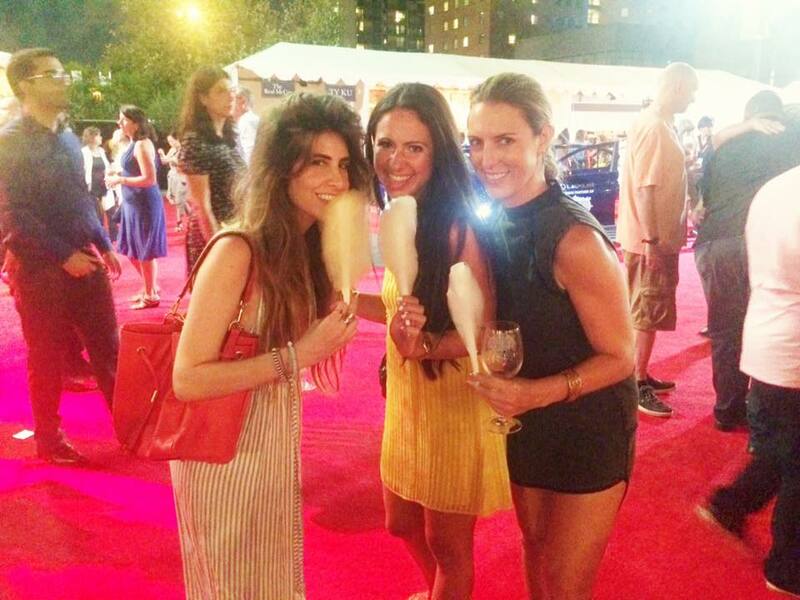 Angeleno Magazine’s Robyn Deutsch, Variety Style Editor Jasmin Rosemberg, and LaLaScoop writer Melissa Curtin enjoying organic cotton candy thanks to Bon Puf at the Los Angeles Food and Wine Festival 2015. 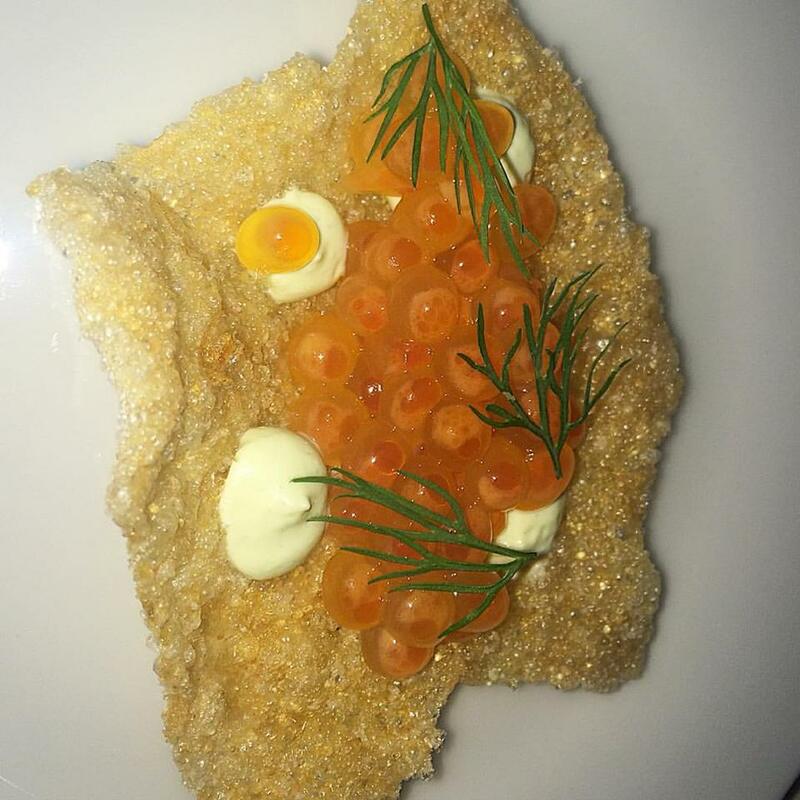 The winning dinner bites Saturday night included Corn and Truffle Agnolotti from Drago Centro, shaved truffles over duck confit tortellini from Patina Restaurant Group, while Bouchon created a delicate mix of ingredients creating a Salad Nicoise. For the adventurous, like me, I sampled Braised Burgundy Snails with sea capers and potato on a creamy foam from Laurel in Philadelphia, 2 foie gras dishes (caramelized white chocolate atop foie gras from Torchon of Hudson Valley and Foie Gras Tart with charred onion meringue, pickled mustard and tarragon from Chef Vartan Abgaryan of the Cliff’s Edge), octopus salad from Herringbone, and a beautifully presented smoked salmon roe tartlet from Mourard in San Francisco on a crisp wonton. Guests were waiting in long lines for the goat meatballs, Cowboy sushi, and Cubano sandwiches being ironed (with real irons) from Joe’s Stone Crab. Produced by Coastal Luxury Management and presented with founding partners FOOD & WINE and Lexus, some of the major chef players included Curtis Stone, Tyler Florence, Nancy Silverton, Thomas Keller, Michelle Bernstein, Kris Morningstar, Michael Chiarello, Alex Guarnaschelli, Antonia Lofaso, Elizabeth Falkner, Ray Garcia, Dakota Weiss, John Tesar, Jet Tila and many more. Bree’s Cakes. 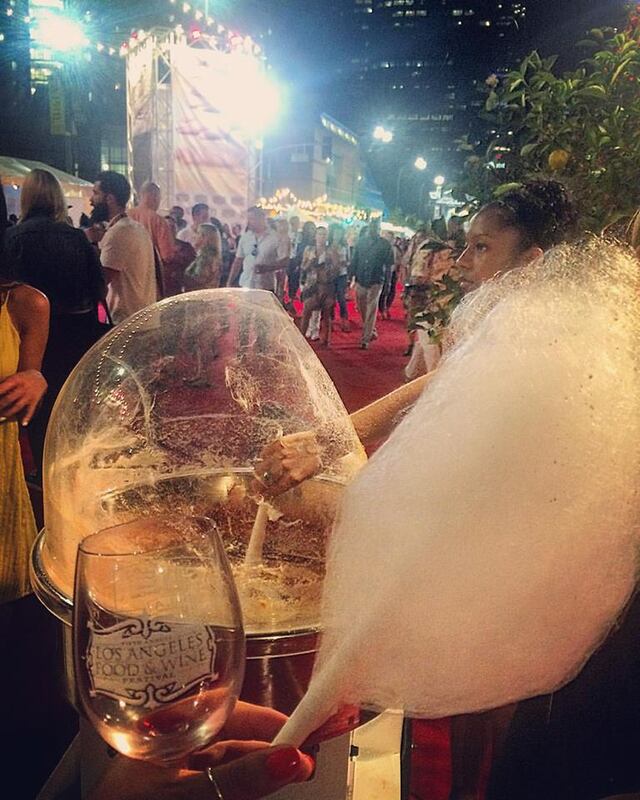 5th Annual Los Angeles Food and Wine Festival 2015.